This decadent dish is similar to a bread pudding. Challah bread is cubed and layered with Wisconsin havarti cheese. 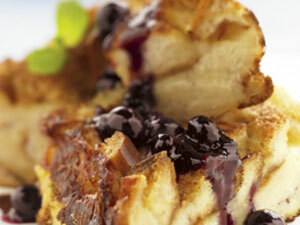 After it’s baked with a sweet egg mixture, top it with warm blueberry sauce. Bake 30 minutes. Uncover and bake 30 more minutes or until lightly browned and set. Let stand 5 minutes before serving.